"JEREMY KANE" now on Kindle. 'Pleased to say, another of my printed books has now been also published in a Kindle edition. "JEREMY KANE: A Canadian historical adventure novel of the 1837 Mackenzie Rebellion and its brutal aftermath in the Australian penal colonies." "Remembering that I'll be dead soon is the most important tool I've ever encountered to help me make the big choices in life. Because almost everything -- all external expectations, all pride, all fear of embarrassment or failure -- these things just fall away in the face of death, leaving only what is truly important. -- read some history books. collapses over loose fiscal policy, always to be followed by a dictatorship." OF TERRORISTS TRAINING AT ARIZONA FLIGHT SCHOOLS AND MISSED THE OPPORTUNITY TO PREVENT TRAGEDY. Two months before September 11, 2001, when Islamic terrorist attacks destroyed New York City's Twin Towers, a Federal Bureau of Investigation agent in Phoenix, Arizona, named Kenneth Williams sent a memorandum to senior FBI officials in New York and Washington, DC. The agent warned about an unusually large number of Muslims taking training at American flight schools. He wrote: "This is to advise the Bureau and New York authorities of the possibility of a coordinated effort by [UBL] Usama bin Laden's Al-Qaeda to send students to the United States to attend civil aviation universiities. The Phoenix office has observed an inordinate number of individuals of investigative interest who are attending or have attended civil aviation colleges in the state of Arizona. The large number of such individuals attending these types of of schools, and fatwas issued by UBL, gives reason to believe that a coordinated effort is underway to establish a cadre of individuals who will one day be working in the civil aviation community around the world. These individuals will be in a position in future to conduct terror activity against civil aviation targets ..."
Agent Williams' warning was ignored at the highest levels of the American intelligence community and government; possibly as consequence of arrogant belief that Moslems were incapable of launching a sophisticated form of attack. CANADIAN SOLDIERS SAY "ADIOS, AFGHANISTAN!" 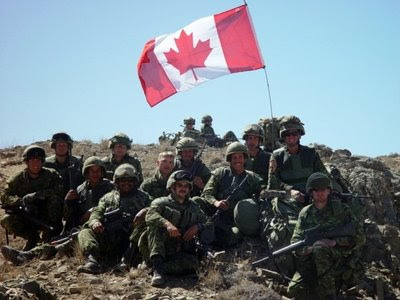 Pleased to say, Canadian troops are being withdrawn from Afghanistan, as of today -- July 8, 2011. After 10 years of service there, and suffering 157 dead Canadian soldiers, our part in that lousy, stupid, futile war is at an end. Complete waste of good lives, waste of good money, and absolute waste of time. machine-gun sparked by a boyhood accident caused to his mother? 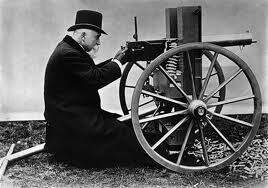 Countless millions of people have been killed by the machine-gun since its design by the American inventor, Hiram Maxin, in 1884. Improbable as it may seem, his idea for the weapon was literally sparked by an accident during his childhood. Late in life, Maxim reminisced about the incident: "When I was quite a small boy, my mother wanted to shoot an owl she saw in a tree in the garden. So she got a gun from the house, an old flint-lock musket and loaded it, but it would not go off. I was siezed with the idea of applying a hot coal to the powder while my mother aimed the gun. So I rushed into the house, returning triumphantly with a piece of hot cinder in a pair of tongs. This I held to the gun, and as I did so, the owl flew off and the red-hot cinder fell and set fire to my mother's dress, burning her badly. This so upset me that I vowed I would invent an automatic gun which would fire itself." Recently, I watched a re-run of a National Geographic TV documentary called The Bombing Of Germany. While emphasising the Allied aerial bombing campaign against Germany in WWII, the programme completely omits the context of it – the Nazi’s preceding merciless air-attacks against Warsaw, Belgrade, London, and virtually every other European country. The book re-awoke bitter controversy over a CBC-TV series, The Valor and the Horror. All three of these revisionist viewpoints claimed that Allied bombing of Germany in the latter stages of the war was "terror" bombing designed to break civilian morale. The obvious anti-British bias of the V&H series by Brian and Terry McKenna left the impression that there wasn't much difference between how our side and Germany waged war. They claimed that massive air raids ordered by Air Marshal "Bomber" Harris (whom the McKennas renamed "Butcher" Harris) had little effect on German war production and was mostly aimed at civilians. At the time, many veterans and others took exception to the McKennas' view. Unquestionably there was an aspect of revenge in the RAF bombing raids -- getting even for the indiscriminate bombing blitz on London and Coventry and many other British cities, aimed at crushing the British will to resist -- part of Adolf Hitler’s spoken promise of waging “total war.” Luftwaffe attacks killed 65,000 British civilians, but only strengthened British resolve and morale. Revisionists’ favourite resentment against Allied bombing of Germany focuses on the RAF/USAAF bombing of Dresden on Feb. 13-15, 1945, which killed approx. 25,000 Germans. This figure was concluded after a five-year research study conducted by the (German) Dresden Historians Commission, and confirmed the estimated casualty report by Dresden’s chief of police in 1945. This figure is far less than the 500,000 death-toll often claimed by far-left groups and sensationalist writers to this day. The fact is that British and German people share certain valiant characteristics, including that neither nationality collapses easily under pressure or adversity. So it should have been predictable that bombing German cities and inflicting an horrendous 600,000 civilian casualties would not completely break Germany's spirit to continue fighting on, even after it was obvious their defeat was inevitable. But as Hitler's minister of War Production, Albert Speer later pointed out that, while bombing didn't prevent German factories from producing guns and tanks, it reduced their numbers. Air-raids also resulted in over 19,000 awesome 88-mm. flak-guns produced in 1942-44 being allocated for anti-aircraft defence of the Fatherland, instead of being used on the battle-fronts. And the need to defend cities against air-raids absorbed a million troops who would otherwise have been fighting at the front. The Allied bombing war on Germany in World War Two cost the lives of 50,000 Royal Air Force crew-members (including 10,000 Canadians) and 50,000 American flyers. A terrible toll, but it did save the lives of countless American, British, Canadian, Russian, and other Allied soldiers. No amount of attempts to re-write history can ever diminish their sacrifice and the rightness of the cause in which they died. A sobering and disturbing thought. On June 13 and June 17, 1942, two groups of German sabotage agents landed from U-boats on shores of Long Island and Florida, as part of a German Abwehr mission, codenamed Operation Pastorius. The mission was named by Admiral Wilhelm Canaris, chief of Abwehr, the German military intelligence organization, a sardonic reference to Francis Daniel Pastorius, leader of the first organized settlement of German immigrants to America. Subsequent events of the sabotage attempt were summarized later in a 1943 report written by British Secret Service agent Victor Rothschild who was sent to United States to be briefed on the incident. His report covered the Nazi mission's objectives; The German personnel sent on the mission; information about the training the German agents received at sabotage school; and the equipment to be used during the operation. During the first few months after the United States officially entered World War II, America's major contribution to the war was industrial. America was able to produce and supply weapons, ammunition, equipment, and supplies to Britain and other nations already fighting against Germany. This infusion of U.S. arms production so stung the Nazi war machine, that the German high command ordered direct aggressive action to reduce American war supply output. However, with the Atlantic Ocean separating Germany from U.S. facilities, the enemy's ability to use conventional military tactics was limited. So German Intelligence decided that sabotage would be the most effective means available to interrupt American production. "The task of the saboteurs was to slow down production at certain factories concerned with the American war effort," Rothschild wrote in his report. "The sabotage was not to be done in such a way that it appeared accidental," he noted. "The saboteurs were however told that they must avoid killing or injuring people as this would not benefit Germany." The saboteurs selected for the mission were eight Germans who had spent time in the United States, and two were American citizens. They were trained at a sabotage school near Berlin, where they studied chemistry, incendiaries, explosives, timing devices, secret writing, and concealment of identity. The U.S. targets planned for their mission included: hydroelectric plants at Niagara Falls, Aluminum Company of America's plants, Ohio River locks, the Horseshoe Curve railroad pass near Altoona, PA, Pennsylvania Railroad's rail yards, a cryolite plant in Philadelphia, Hell Gate Bridge in New York; and Pennsylvania Station in Newark, New Jersey. The first batch of saboteurs arrived by U-Boat U-202, at Amagansett, Long Island, New York. They wore German military uniforms, so that if caught they would be handled as POWs and not as spies. The second batch came aboard U-boat U-584 and landed at Ponte Vedra Beach, Florida. The first group included George John Dasch. Victor Rothschild perceptively wrote in his report, "It is abundantly evident that the leader of the first group of saboteurs, George John Dasch, had every intention of giving himself up to the American authorities and compromising the whole expedition, probably from the moment it was suggested to him in Germany that he should go to the USA on a sabotage assignment." Dasch did exactly as predicted, promptly going to Washington, DC, to turn himself in to FBI headquarters. He simply telephoned FBI headquarters from his Washington hotel room and waited for Federal agents arrived to take him into custody. The FBI at first treated Dasch as if he was mentally unstable, until he showed them $84,000 he was given to fund the operation. His co-operation helped lead to the other seven saboteurs being taken into custody over the next two weeks. They were put on trial before a secret military tribunal comprised of seven U.S. Army officers appointed by President Roosevelt. The trial was held in the Department of Justice building in Washington. The prosecution team was lead by Attorney General Frances Biddle and the Army Judge Advocate General, Major General Myron C. Cramer. The Defense team was lead by Colonel Kenneth C. Royall, who later became Secretary of War under President Truman, and Major Lausen H. Stone, the son of Harlan Fiske Stone, the Chief Justice of the U.S. Supreme Court. All eight would-be sabotage agents were found guilty of espionage and sentenced to death. However, because of their cooperation, President Roosevelt commuted the sentences of Peter Burger to life in prison and George Dasch to 30 years in prison. On August 8, 1942, the other six were executed in an electric chair on the third floor of the District of Columbia jail. Their bodies were buried in a cemetery potter's field called Blue Plains in the Anacostia region of Washington. In 1948, President Truman granted Burger and Dasch executive clemency, and they were deported to the American Zone of then still-occupied Germany. Sidney Allinson. A Canadian novelist, military historian, and advertising consultant. He is author of six books, was creative director of three advertising agencies, and communications policy advisor to the Ontario Government. www.esid.info His factual military history, "THE BANTAMS: The Untold Story Of World War One," is now published by Pen and Sword Books in the UK. Sidney also wrote JEREMY KANE: A Canadian historical adventure novel of the 1837 Mackenzie Rebellion and its brutal aftermath in the Australian penal colonies. His latest is "KRUGER'S GOLD: A novel of the Anglo-Boer War." Sidney served overseas with the Royal Air Force, is a past-Director of the Royal Canadian Military Institute, and received the Boulter Award for outstanding writing. Born in England, a long-time resident of Toronto, he now lives in Victoria, British Columbia, where he is Chairman of the Pacific Coast Branch of the Western Front Association, and President of the Sir Winston Churchill Society of Vancouver Island. Currently, Sidney is working on a novel about the 1942 Dieppe Raid, and a history of the first fifty years of the Victoria Cross.